Ever Since OceanWP came into the market, things have become a lot easier and creative in web development. This is reflected by a large number of users OceanWP has all over the world. As a part of this OceanWP Review, I installed the theme on one of my niche sites to comprehend the way it actually works. The result was simply outstanding. I was simply taken aback by the kind of ease and powerful customization options that it offers. Interestingly, I had been able to create a stunning website in less than an hour. I understand that it’s quite hard to imagine design a website that fast but as I explain the various features of this theme in this OceanWP Review, it will certainly believe it. The OceanWP Theme was developed back in 2016 by an aspiring developer Nicolas who had been creating WordPress websites for his clients back then. Prior to the development of this theme, Nicolas had a constant need of a better theme while building websites for various clients since none of the available themes back then actually served his purpose of creating excellent websites for various projects without having to spend much time. With more time spent on building a website, it was actually increasing the cost of the service. Apart from that, the premium themes available back then were pretty complex and clients would often find it pretty difficult to use. Finally, this has led to the idea of developing a theme that would be easy to set up and easy to use. By now, the theme is one of the most extensively used WordPress theme with over 1,119,594 downloads. The OceanWP has been to a large extent able to help developers and webmasters overcome the obstacles that came in the way of web development. The theme is very well conceived. It makes designing pretty easy and also, saves a lot of time. Also, it can be conveniently used with most of the page builders. The theme is fully responsive and looks equally great on mobile and tablet screens. Websites have exceptionally fast page loading time (Check OceanWP Vs GeneratePress Vs Astra) and it has largely proved it over the years when hosted with perfect hosting companies. Helps you build an amazing e-commerce website with the market-leading WooCommerce integration. The theme has been built with the best SEO practices in mind and is perfectly SEO friendly. Users can extend the functionality of this theme using the core extensions bundle and using powerful extensions such as Stick Anything, Full Screen, Cookie Notice, White Label, Portfolio, Woo Popup and more. The theme works perfectly with most of the WordPress plugins like Thrive Ultimatum and you can build any type of excellent WordPress websites with the greatest ease. It increases your conversion rates with the Native Cart Popup, Floating Add To Cart Bar, and the Off Canvas Filter. 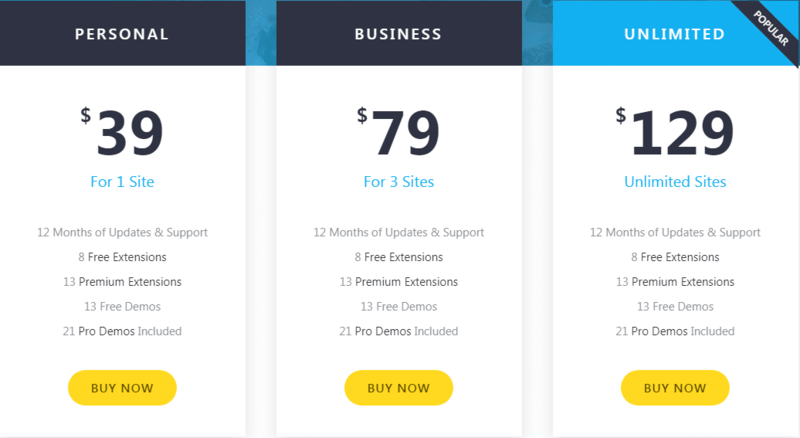 Also, it offers a large number of free demos to find a perfect design for your website and it actually allows you to even import a demo with a single click so as to get your website build even faster. OceanWP offers 14 days money back guarantee for all the plans. Also, it is Translation and RTL ready which means you can translate the theme to any preferred language. The Pricing is available on both an annual and lifetime basis. To get started with, you may choose it on an annual and after you are completely convinced with it, you can opt for the lifetime membership by paying a one-time subscription. All the plans actually come with 14 days money back guarantee which means just in case, you are not happy with it, you can simply cancel your account within 14 days from the date of its purchase and 100% of your money will be refunded back to you. While writing for OceanWP Reviews, the lifetime license was still available but I wasn't sure whether the deal will last for long. The pricing is very similar to the likes of Astra (Review) / GeneatePress Review and makes a decision yourself. With themes like the OceanWP, it has offered a huge space for developers to be more creative with their works since it can be set up pretty easily and customized to any desired extent without having to spend much time. 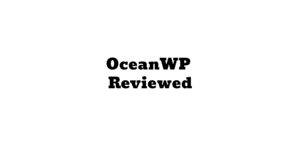 I'll update this OceanWP Review with site loading time, speed and much more info in near future. Needless to say, OceanWP is a theme with comprehensive and powerful features. On top of that, it can be used with page builders to build exceptionally attractive websites without having to deal with much complexity.